Ever thought The Walking Dead would be better with cute anime high school girls? Well, Japan has heard your prayers. School-Live! is the story of four students, their teacher, and their dog who are holed up in their high school during the zombie apocalypse. However, instead of focusing simply on survival, the small group tries to live a happy school life despite their impending doom at the hands of the walking corpses that were once their classmates and friends. The strongest facet of School-Live! is this premise. On one hand, it is a high school slice-of-life centered on cute girls doing cute things. They have a school field day, enjoy a swimming party, and even go on field trips together. Of course, the other side of this is that it is all taking place in a zombie apocalypse—and this is played completely straight. The group is constantly worrying about food and their safety even as they do things that have nothing directly to do with their survival. This dichotomy and how it affects each character is both the driving force and underlying theme of the anime. We as viewers are faced with an anime that can be all smiles one minute and the next shows us the most messed up things the zombie plague has to offer. When it comes down to it, it is the insanity of living a normal school life in the apocalypse that helps the girls keep their sanity. Each of the four students serves a role in their small society. Yuri is the responsible leader—making sure the day-to-day necessities are met and the group doesn’t starve. Kurumi is their muscle, the only one of them proficient at killing the undead. Miki is the outsider—the newest member of the group—and is willing to ask the tough questions about the group’s survival. And Yuki comes up with all the fun activities that keep everyone’s morale up. At the same time, each is on the edge of breaking. Yuri struggles with the burden of being responsible for the others, knowing that even a single mistake could end with them all dead—or worse: undead. Awake or asleep, Kurumi is never without her shovel—her weapon of choice for zombie killing. Each day she has to kill numerous zombified students that threaten the group—even if they were once her friends. Miki enters into the group after surviving for months on her own and has a problem understanding why the group insists on pretending that the world hasn’t ended. And Yuki? She’s completely insane already. Almost the entirety of the first episode of School-Live! is spent showing the world as Yuki sees it. To her, she is part of a club—the School-Live club—the members of which live at the school and aren’t allowed to leave campus. Every morning, she gets ready, eats with the others, and then goes to class—spending her day with her classmates and listening to the teacher’s lectures before returning to the club. Of course, she is delusional. She actually sits in an empty classroom still stained with blood and debris, talking to herself for hours on end. To Yuki, the zombie apocalypse simply didn’t happen. She doesn’t see the broken windows or the zombie students milling about outside. Everything seems normal. This means, in her world, doing school activities is perfectly natural and not strange at all. When she sees the others feeling down, she immediately jumps in with a fun school activity for them to all do together. While these activities may seem foolish to those such as Miki who have not been with Yuki the entire time, the truth soon becomes apparent: Yuki’s insanity keeps the others sane. After all, surviving is not the same as living. What’s even more interesting is that, by the end, Yuki accepts what has happened—that the zombies exist and only the four girls remain. But this revelation doesn’t change how she acts. It’s the opposite, really. She can suggest fun activities because she is at peace with the world as it is—a world of the living dead where each day will likely end with everyone she knows being killed horribly. When you think about it like that, her acceptance of this perhaps means she is even more insane than before. Another interesting facet of the show is its zombies. These are the old-school Romero zombies. They aren’t fast nor are they particularly strong—but they come in large numbers and never stop. Moreover, all it takes is one bite and you’re one of them. In fact, the speed of the infection on the day of the outbreak is terrifying—all it took was a single day for the entire city to fall. But what makes these zombies stand apart from most others in fiction is that there is clearly some part of humanity that remains in each. Oh don’t get me wrong, it’s not enough to make them not want to eat your face. However, the zombies instinctively react to their former lives—i.e., students still come to school and adults still go through the motions of their jobs. And it’s rather brilliant how this aspect of the undead comes into play over the course of the series. Unfortunately, School-Live! is not perfect—and its most glaring failure is one key plot twist and how it is directed. At the halfway point of the series, we learn that the single adult in the group, Megumi, has been one of Yuki’s delusions for her entire screen time (outside of certain flashbacks). The real Megumi died before the start of the anime. The problem with this is that while there are hints to suggest she is not really there, the director makes it an unfair mystery—i.e., one we cannot truly solve because he supplies us with false information that has no other purpose but to trick us. The big reveal of the first episode is that all we had seen of Yuki’s normal school life was from her skewed point of view. From that point on, we assume we are seeing the world from the point of view of the other three girls. However, that’s not the case. Instead, we are seeing the world from the point of view of the other three girls—except we can see Yuki’s Megumi delusion for some reason. In other words, no character sees the world as the viewer does. This makes it an unfair directing trick to make the twist seem clever when it’s revealed—even if it’s not. That’s not to say this twist couldn’t have been done well. 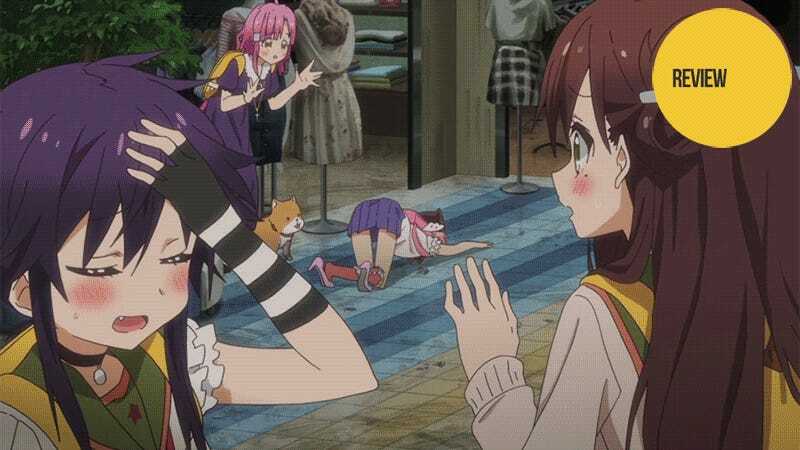 If the Megumi delusion were only seen in rooms that were in good repair that look the same to Yuki as to everyone else—like the club, shower, sleeping rooms, or the roof—or at times of crisis when the real world intrudes on Yuki’s personal reality, it would be a fair mystery and excellent directing. However, the moment we see Megumi standing in a bloody room alongside Yuki, it is a cheap trick and nothing more. The other aspect of the show that seems off is the setting—i.e., the school itself. While I understand that this is set a few months after the zombie apocalypse, the state of the school makes it look like it has been abandoned for years. There is not a single unbroken window in the hallways and paint is peeling off nearly every wall. Rooms outside of the ones they frequent appear ransacked—but by who? Neither the zombies nor the girls would trash a room looking for something. But more than that, gore still litters several areas the girls frequent—including the classroom that Yuki goes to everyday. In the months following the last attack in the living area, no one has bothered to clean up the zombie blood and turned-over desks in the room one of them practically lives in? Similarly, the windows in the hall are all broken and jagged, but they haven’t put anything over them? Yuki is going to cut her arm off one day! I suspect this is a case of ambiance over logic. Does it make sense for Yuki to be sitting in a ransacked, blood-splattered room all alone with her best friend’s broken necklace lying on the floor when the others could have easily cleaned it up? Not at all. But it does make for one hell of a haunting image. School-Live! is a great example of the fun that can be had when genres collide. While it is not without its issues—largely stemming from questionable directorial choices—it ends up being both an enjoyable slice-of-life anime and a zombie survival story. Moreover, it uses the two genres to explore life, death, and dealing with loss as well as to explain a bit about why so many anime are set in high schools—which is more than you’d likely expect for an anime about cute girls and zombies. School-Live! aired on Tokyo MX in Japan. It can be viewed for free and with English subtitles on Crunchyroll and Hulu.